Ulixis Crafts: Contest + Trades = FREE STUFF!!! I love getting free stuff!!! Who doesn't??!?? Here are the two easiest ways (that I've found) to get free handmade stuff on Etsy: contests and trades. Both do require some time: contests usually require you to complete a task (which is half the fun!!) and finding trades means looking through long, long, long threads in the forums. But it's well worth it for FREE stuff!! So first I entered a contest held by CGGE (the creative glass guild of Etsy), an Etsy street team. You had to search through a large list of team members's shops and find a picture of a candy corn in one of their listings. Let me tell you, some of them were really tricky!! And there were sooooo many!! But it was well worth it because I won!! There were 3 prizes to be won, and my name was picked out of 11 correct entries. 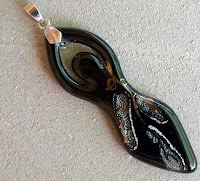 My prize is this beautiful goddess pendant handmade by dyzart. I can't wait to get it!! My friend gave me some good advice a while ago, and I finally had the good sense to go do it. That is, search through the forum for trades. There are TONS of threads for it. Pages and pages. I added myself onto the list, I think... it was hard to tell because near the end of so many threads someone would post that there was a new thread and not to post in this old one. But I sent a bunch of convos out to shops that I was interested in, and hoped for the best. To my surprise, I heard back almost right away from, not one, but two great shops!! First ccquilter was happy to make me a custom crochet toque (in either green and brown or blue and gray .. it'll depend on what wool she has around) in exchange for my gardens of gingham notebook. Here's the hat in pink and black. I can't wait to get it!! Then, as I was negotiating that trade, I heard from nakedtile. She was interested in my red and white bracelet (and asked that I remove the dangle and add a few o rings for length) in exchange for this great stash of buttons.